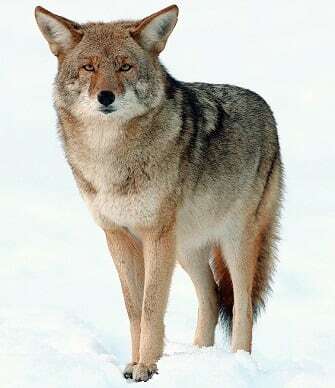 The Coyote, who is also known as the Brush Wolf and American Jackal, is a close relative of the wolf. It lives throughout North America, Central America and parts of Canada. There are not many habitats where they cannot be found as they are able to easily adapt to their environment. They are found anywhere from large cities to desert regions to temperate rainforest regions. The information listed below provides facts about this interesting animal including how long they live, what they eat, why they can be mistaken for domestic dogs, when they breed and much more. This information is written for both kids and adults. Click here for a great selection of Amazon.com books about Coyotes. Coyotes have pointed ears, long furry tails, and pointed, slender faces that can look very similar to a domestic dog. For this reason they are sometimes mistaken for German Shepherds. Lions, bears, cougars and even wolves often prey on the Coyote, but the main enemy of the coyote is disease and death by humans. They are hunted and trapped by humans but large numbers are also killed by cars each year. Coyotes can live in the wild for up to 14 years. In captivity they have been known to live up to 20 years. Panting is the Coyotes way of regulating its body temperature. Coyotes can run an impressive 40 miles (64 kilometers) per hour. Breeding begins at about one year of age and once mating begins they will usually keep the same partner for life. Breeding season occurs in late winter and after a gestation period of approximately two months, a litter usually between 4 and 7 pups is born. Coyotes are known for their strong senses, particularly their sense of hearing and smell. They can hear when prey is underneath the snow and can also sense when hunters are over a mile away. Coyotes are omnivores who eat meat as well as a variety of fruits, insects and carrion (dead animal carcasses). Coyotes will eat whatever is available to them and will adjust their hunting style accordingly. They will hunt alone for small prey such as rabbits, frogs, and rodents by stalking and then pouncing. Larger prey such as calves, deer and lambs requires hunting in a pack. Because some coyotes live in close proximity to domestic dogs and cats, they have been known to kill and eat them. What may sound like a howl to a person is the Coyotes way of communicating with other pack members. Howls are often a response to hearing another coyote that may have signaled that food has been found. Coyotes make a variety of vocal sounds. A woof or a growl can signal an alarm or be a danger call. A whine is usually a greeting. A softer yip can signal that a pack has reunited. Coyote pups begin making noises at a few months of age to test their voices and practice. When family groups yelp in chorus it can sound like a much larger group of Coyotes and may scare off any potential enemies. Dawn and dusk are the most active times for coyotes to communicate.